The most popular symbol of Christmas in the Philippines is the parol. It represents the blessed star of Bethlehem. For Filipinos, not having a parol for decoration makes Christmas somewhat incomplete. The parol’s size depend on where it will be hung. A very large parol is usually used for high-rise buildings. For regular houses, parols are smaller. The Parol is a Filipino Christmas tradition that’s been in the Filipino Christmas tradition for 100 years. The Filipino Parol is a 5 point lantern star made from Bamboo sticks assembled as a star and lights up at night just like a Christmas Light. Colorful paper 24″ x 24″ (60 x 60 cm). You can use thin Japanese papers or shiny gift wrappers as substitute. Use thread to tie the ends of each bamboo strip together, forming two circles. Use the two circles and five of the 7-inch (17.5 cm) wire strips to make a frame by twisting the ends of each wire strip around the bamboo circles as shown. Fold the colorful paper in half. Draw the shape of a five-pointed star and cut it out. You will have two stars. Glue one star to each side of the circular frame. Attach the other five 7-inch (17.5 cm) wires to the five points where the angles of the star touch the wire frame. Attach the five 3-inch (7.5 cm) wires to the tips of the star so the star bulges. Tie some thread to one of these wires. Glue on pieces of paper to cover the frame. Attach tinsel to the two bottom points of the star. Make a star pattern, and glue five of the 10 inch strips of wood or matte board to make a star. Allow the glue to dry completely. Repeat with the other five strips. The two stars should be identical. At the five points of one of the stars, glue the five 3/4 inch strips of wood so they are in an upright position. Allow glue to dry. Place a dab of glue on the top of each of the shorter strips. Position the second star directly over the first one. Apply a bit of pressure at the joints to be sure they affix to the shorter strips. To finish joining the stars, place a dab of glue at the five points of the star. Press together the points of the two stars. Use tape to secure the points until the glue dries. Remove the tape. Be careful not to pull the points apart. To cover the star, place the glue on the surface of the outside strips (those that make up the points) on one side of the star. Position one of the 12 inch by 12 inch pieces of tissue paper on the side with the glue, so the star is centered on the paper. Keep the tissue as smooth and as tight as possible. 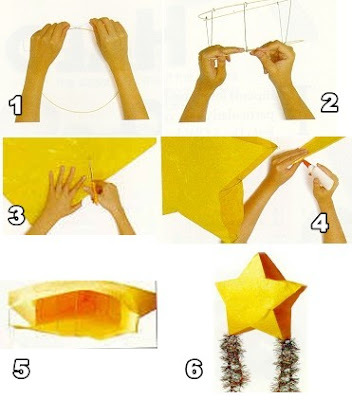 Once the glue has dried, turn the star over, and repeat this step with the other 12 inch by 12 inch piece of tissue paper. Again, allow the glue to dry. Trim some of the excess tissue paper, leaving enough to cover the sides of the star. Cut 7/8 inch slits in the joints. Fold each flap over, and glue it to its corresponding wooden strip of the star. Once the flue dries, trim any excess paper. While the star is drying, make the paper tassels. These look best if a different color tissue paper from that which covers the star is used. Fold each of the two 8 inch by 16 inch pieces of tissue paper so that the 16 inch length is in half. With the scissors, make cuts 3/8 inch wide and 6 inches long, leaving 2 inches at the folded side. Open one of the tassels so that there is fringe at both ends. Fold the tassel in half length-wise, and squeeze both sides of the center. Poke one half of a 6 inch wire through the center of the tassel. Repeat these steps with the other tassel. Fold the tassel in half so that all the fringe is together. Wrap the bottom half of the wire (that which is now covered with the fringe) around the area just at the top of the fringe. Repeat with the other tassel, using the second 6 inch wire. Attach the tassels to the lower points of the star by poking the 3 inches of exposed wire through the tissue paper on the star. Poke 2 inches of the 10 inch wire through the tissue paper at the top point of the star. Wrap the 2 inches of wire around the point, and wrap the end around the remaining wire. Use the 8 inches of wire left over to form a hanger. To cover the wires of tassels at the bottom points and to put tassels on the other three points, fold in half each of the five 10 inch pieces of tissue paper. With scissors, make cuts 1/8 inch wide and 2 1/2 inches long, leaving 1/2 inch at the top. To attach the tassels, spread glue on the uncut 1/2 inch area. Carefully, wind the glued end around each of the five points of the star. Decorate the star using markers, glitters, etc. Cut patterns out of construction paper, and glued them on the star. Make up a pattern. To do so, fold a sheet of construction paper in half. Copy the pattern onto the paper, making sure the fold on the paper corresponds with the fold on the pattern, and then cut the pattern out. Use a zigzag motion with the scissors to create a unique edge. Unfold the paper, and place glue only on the longer edges. Position the pattern on the star with the glued end toward the tassel. Repeat this step with the other four points of the star. Paper scallop can be glued to the sides of the star. With a compass, draw a 4 1/2 inch circle on the construction paper. Cut the circle out, fold in half, and cut along the fold line. Fold the half circle in half four more times until you get a very small wedge. Open the paper up, and refold using the fold lines to get accordion pleats. repeat these steps with nine more half circles of the same size. Glue one paper scallop to each wood support on all sides of the star. You may also make scallops using 6 1/2 inch circles. These can be glued between the smaller scallops.